To be honest, I’m obsessed with composting! Totally! As I chop up my kitchen scraps, garden trimmings and fallen leaves and add them to my backyard compost pile, I start salivating. I’m making “black gold.” I’m recycling to the max, saving those landfills, and giving back to the earth! To my garden! To the health of my sweet, lovely plants! I will have such selfish joy watching them thrive. I can’t stop myself. I hoard every last bit I can! Family members are reprimanded if they dare throw a banana peel or an eggshell into the regular trash, or try to dump our grass clippings elsewhere. Slowly my compost pile grows as I turn, layer and water it. I keep adding more “stuff” as it becomes available, with every addition kissed with satisfaction and pride. 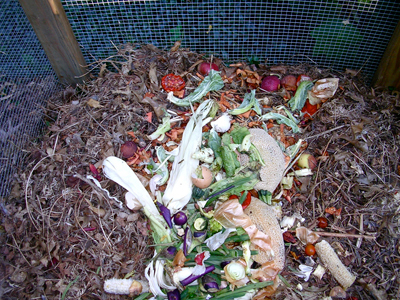 Of course, composting does take a little know-how, or a great deal, depending on your level of interest or desired outcomes. A very simple method called “cold composting” requires no more than throwing your organic material onto a backyard pile and letting it sit for a year. However, if you wish to speed up the process, you will need to provide the best possible environment for the beneficial organisms to do their work, namely a compost bin or cone, or fenced area. The task then is to balance the carbon-rich materials (brown -- dry leaves, straw, sawdust, shredded paper, cornstalks) with the nitrogen-rich materials (green -- fresh grass clippings, vegetable/fruit scraps, manures, seaweed) with proper moisture content (similar in feel to a well-wrung sponge), and plenty of oxygen (aeration through turning periodically). This balance happens if you simply use about three times as much brown (carbon-rich) material as green (nitrogen-rich) material. But it doesn’t have to be exact either. Compost will still happen. You can even make “bacteria” dominated compost, or “fungally” dominated compost. And over weeks and months, this organic matter heats up and decomposes through the fine work of beneficial organisms and microbial populations of bacteria and fungal hyphae, as well as protozoa and nematodes. Remember those names from high school biology? With a balance of air, moisture, and the right ratio of carbon and nitrogen found in my dead stuff, they work their magic. It hopefully becomes dark brown, crumbly, fluffy, earthy, luscious gold. And I lovingly carry it around my yard, adding a little here and a little there to my flower beds, my vegetable garden, my new plantings, under certain trees and shrubs, and around my lawn. There are a myriad of how-to articles online and in magazines and whole books written about composting. Cutting-edge research using electron microscopes showing how it all really works is also available and understandable (Teaming with Microbes, A Gardener’s Guide to the Soil Food Web by Jeff Lowenfels and Wayne Lewis, Timber Press, 2006). Go find what suits you – your level of interest, your type of yard, your time availability. And begin to enjoy the fruits of your labor the natural way.